CONCORD, N.C. -- Third place isn't usually something that gets celebrated in racing. But when Melanie Self climbed out of her car after the "Better Half Dash" at Charlotte Motor Speedway, her third-place finish left her with tears of joy. 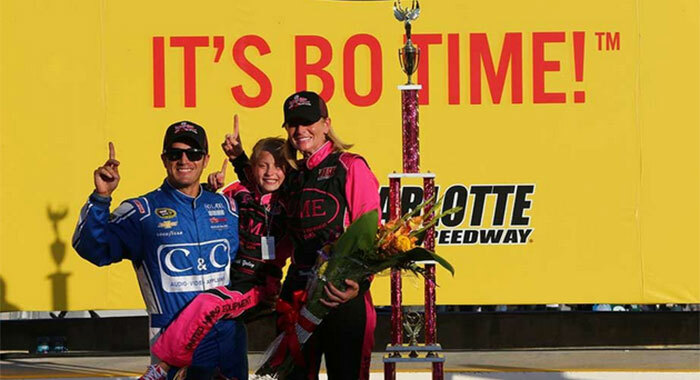 Racing a bright pink car and sponsored by "No More Cancer," Self explained she made a promise to former NASCAR driver Shawna Robinson and Sherry Pollex, girlfriend to current NASCAR Sprint Cup Series driver Martin Truex Jr. Both women are battling cancer and Self told them she'd make it to Victory Lane. When the checkered flag fell, the top three drivers were ushered to the winner's circle at the speedway, and the promise was kept. "I've cared for Shawna's children," Self said, a member of Motor Racing Outreach (MRO) for the last 14 years. "I cared for Sherry long before she was ever Martin Truex's girlfriend, she was just a daughter of a car owner. So they're my friends, and I wanted to do something special for them, and bring awareness." It was the fourth year for the event, organized by MRO. The race included 11 drivers, many of whom are wives or girlfriends of drivers currently in NASCAR. Kristen Yeley, wife of Sprint Cup Series driver J.J., won this year's event and earned $10,000 for charity. Twenty-five hundred dollars of it went to Speedway Children's Charities, $2,500 to MRO, and $5,000 went to "Yantz's Son is Back Foundation," a group chosen by Yeley that advocates for organ donation. "I've been waiting for this for four years," Yeley said. "I came very close last year. So this is pretty sweet." The charity work started well before the green flag dropped. Each participant raised money prior to the event, with the highest-earner winning the opportunity to pick her starting spot for the race. Ashton Bayne, wife of Nationwide Series driver Trevor Bayne, edged out Amy Reimann, girlfriend of Dale Earnhardt Jr., for the top spot. In all, the group of 11 raised more than $70,000 for their various charities. That was more than double last year's total. The event had plenty of interested spectators. Earnhardt Jr. watched Reimann from the ESPN Pit Studio along with Denny Hamlin. Their crew chiefs, Steve Letarte and Darian Grubb, joined drivers Regan Smith and Clint Bowyer in watching from pit road. The race itself was cut short of the scheduled 25 laps due to multiple cautions. Reimann wrecked on the first lap, knocking herself out of the race. Not long after, Ashley Allgaier hit a bump and broke a tie rod, ending her race early. "It's worse than getting in the car to go qualify," Ashley's husband, Justin, said about the nervous feeling he gets watching his wife race. "But it's such a cool event, and they raise such a great amount of money for great causes. You can’t get any better than that."